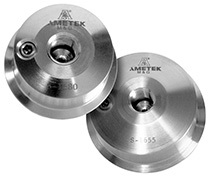 M&G C Series diaphragm seals feature a simple, one-piece design with diaphragms fastened directly onto the top housing. Type C seals are crafted of 316 stainless steel with quick-couples that meet 3A Standards per specification 37-01 for use in sanitary piping applications in the food, beverage, pharmaceutical, and other industries requiring extreme levels of purity. Type C Series diaphragm seal elements are designed to mount on tees or welding ferrules. Their design allows for fast, efficient removal and installation for flushing or changing process media, line cleanout, and equipment washdown situations. Seal pressure and temperature specifications are determined by the sanitary piping system limitations.